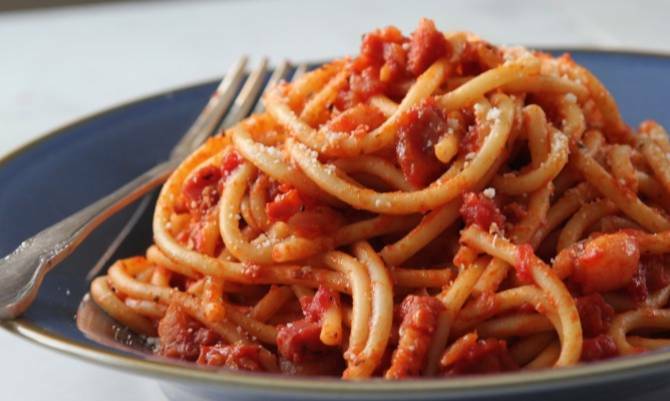 The Amatriciana or matriciana is a typical dish of the Italian tradition, known and appreciated in every region. The name comes from Amatrice, a town in the province of Rieti. 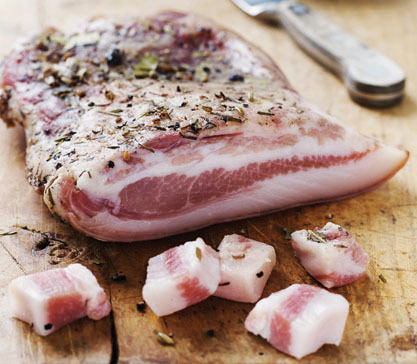 The main ingredients are guanciale (jowl bacon), pecorino cheese and tomato. In the nineteenth century and until the beginning of the twentieth century the popularity of the dish in Rome grew considerably. This happened because of the close contacts between Rome and Amatrice. Many innkeepers and restaurant owners in the city were from Amatrice, so that the term “Matriciana” came to mean “inn with kitchen”. The pasta Amatriciana was very well received and quickly became a classic dish of Roman cuisine. 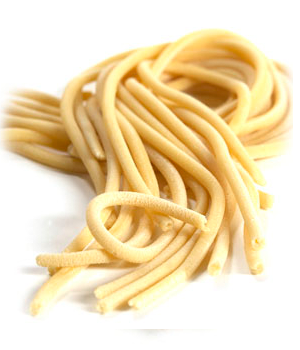 Although you can use any type of pasta, the tradition requires to use bucatini (large spaghetti hollowed in the center). Bring to the boil the water for the pasta. Meanwhile, cut the bacon into cubes eliminating the hard parts (rind), put on the fire a frying pan and when it is hot, combine the bacon and let it cook on low heat with a little oil. Add the tomatoes, peeled and chopped and cook over high heat for about ten minutes; season with salt, pepper and remove from heat. As soon as the water bubbles, add the salt and the pasta to cook it. Drain the bucatini “al dente”, season with the sauce, sprinkle with cheese and mix everything. To better appreciate the dish, put the pasta Amatriciana in the dishes and add more grated cheese before serving. Enjoy this delicious recipe with family and friends, accompanied by a good glass of Italian wine! Buon appetito! !